Make it fun! Make a camp t-shirt to bring you all closer together and connected, after all that is the beauty of camping; disconnecting from the hustle and bustle of life and enjoying the great outdoors. 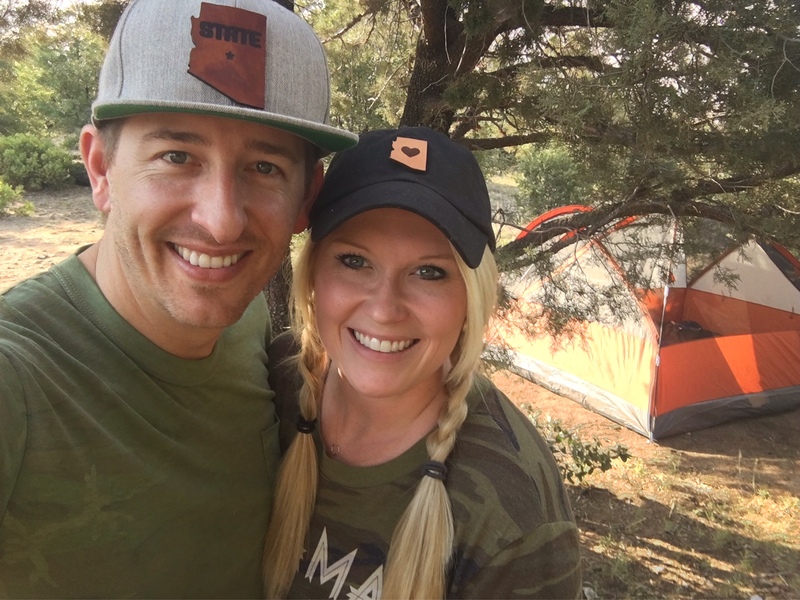 We wore a lot of camo to bring in the camping spirit. 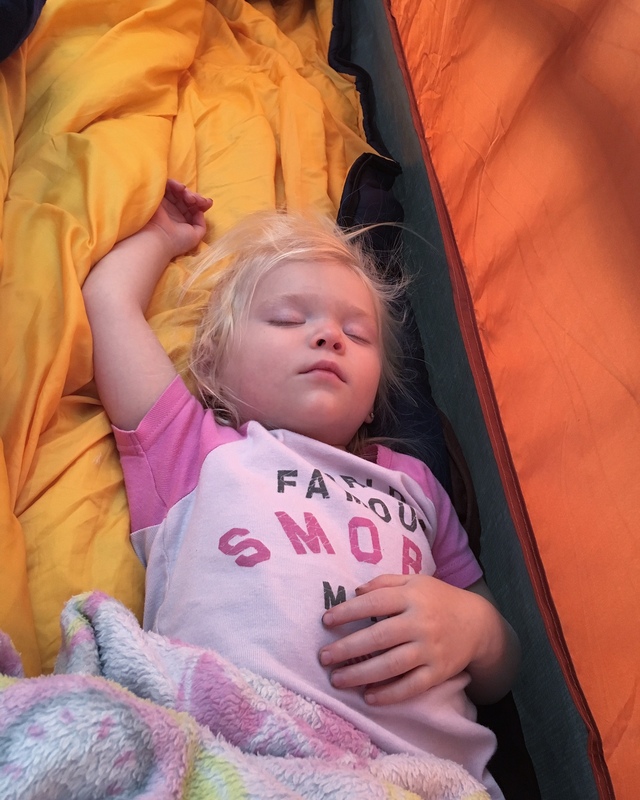 Click HERE for cute camping tees for the whole family. We also made a family chant that we would cheer out throughout our time. It’s the little things that they will remember! Don’t be afraid to improvise, after all, we’re talking about kids… and they are far more adaptable and flexible than most of us realize! As an example, we were forced to improvise even before we set out to our campsite. 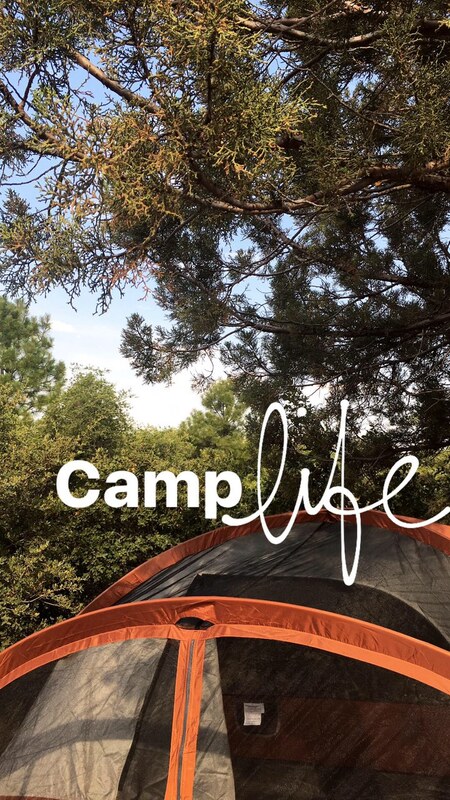 What’s the one thing you HAVE to do when camping? Have a camp fire, of course! Well as luck would have it, during the time in which we planned this trip, the state of Arizona happened to be under a temporary fire ban due to the dry fire season we are having. So, instead of being negative about the idea of no campfire, and worse yet, no s’mores by the campfire, we decided to improvise. 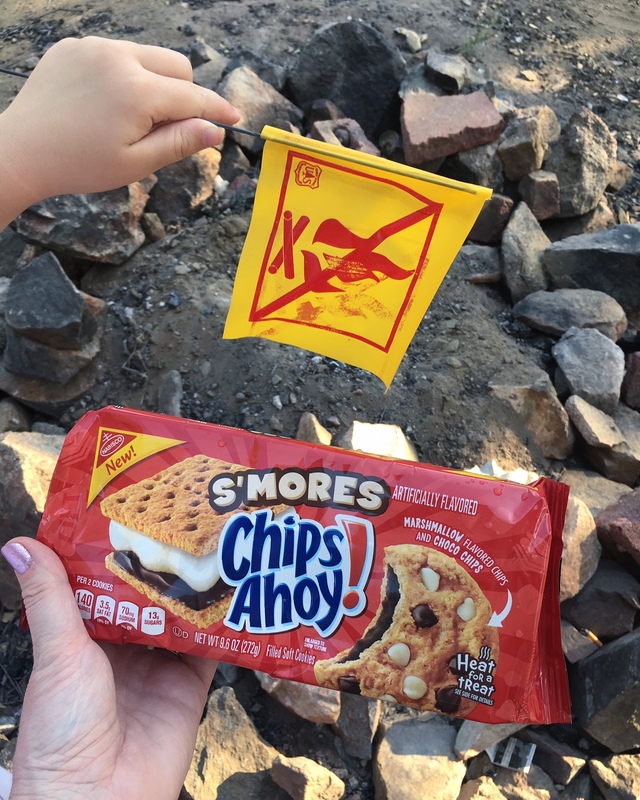 Thanks to Chips Ahoy, we were able to find S’mores cookies, and we had those in camp instead, and of course the kids loved them! No matter what you do, be ready for anything! Life is full of unexpected changes, and that’s what makes it exciting! 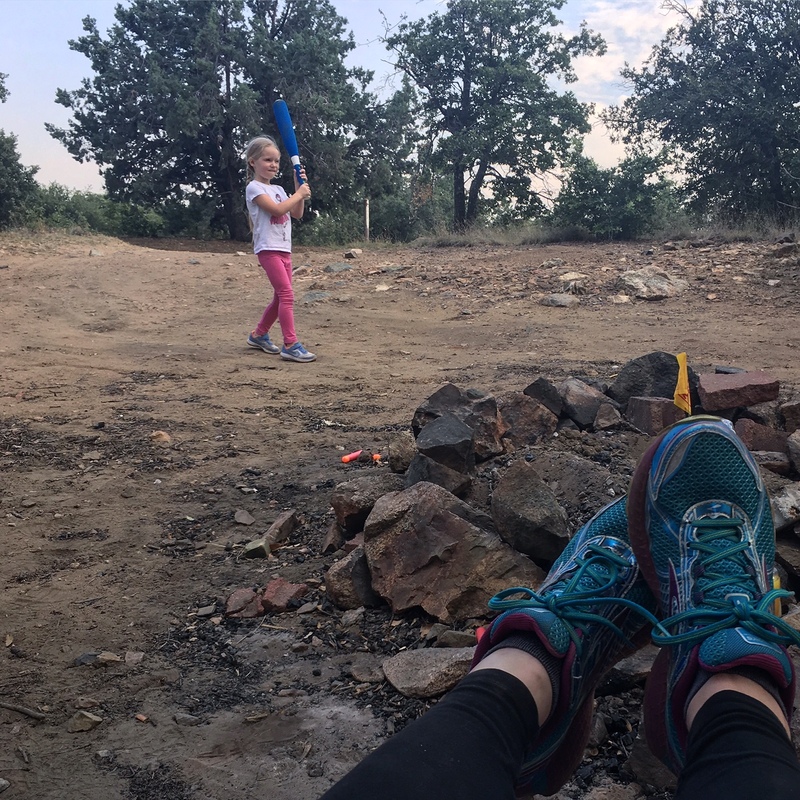 Activities: When you are at the campsite you have a lot of time to sit around and talk and be chill, but you know kids… they like to be entertained. Here are a few of the activities we organized to make it enjoyable. Go on a nature walk or hike, and if you are near water, be sure to bring fishing poles. 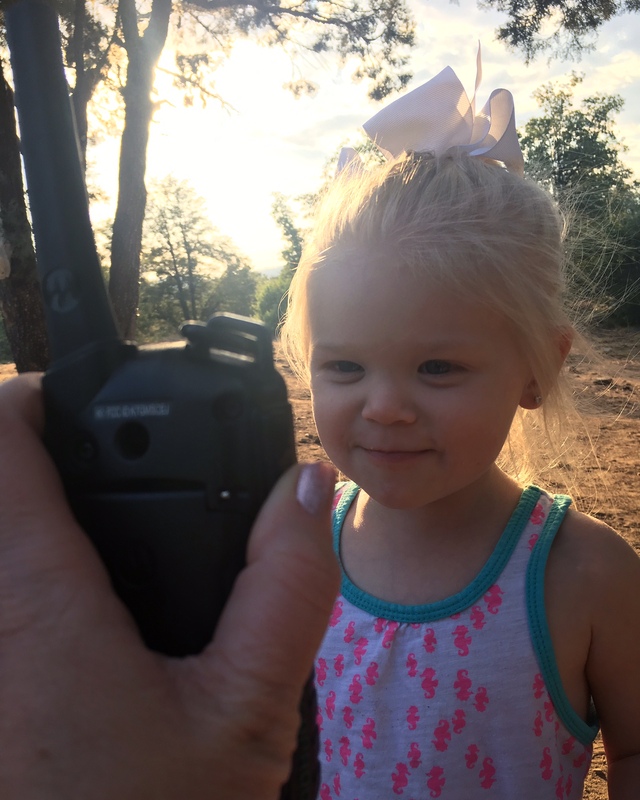 Have a walkie-talkie scavenger hunt. 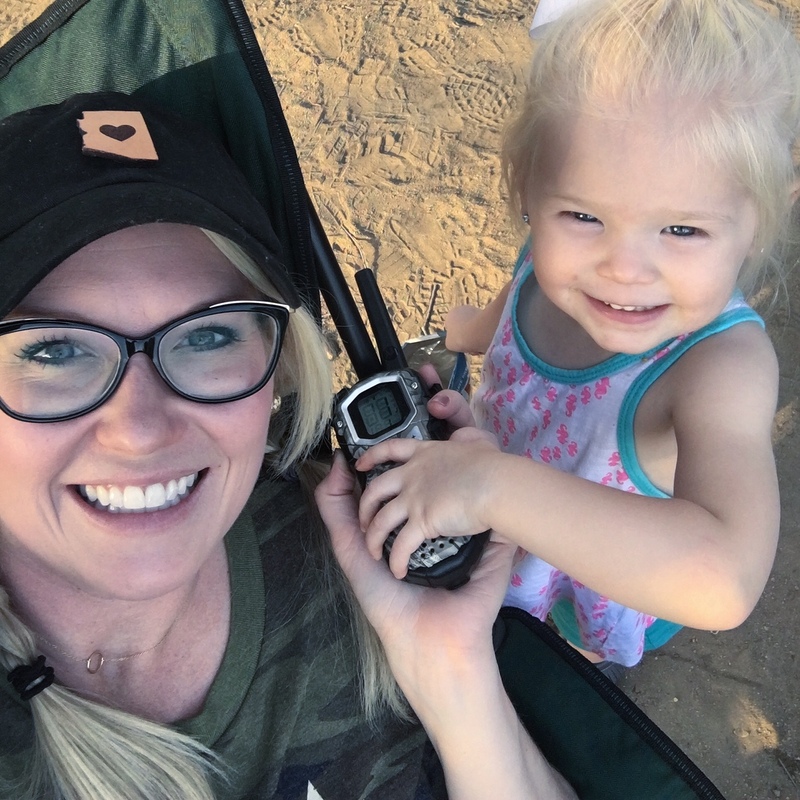 The girls had to announce in the walkie talkie whenever they found certain things; pine cones, specific shaped rocks, and even a snake! Half the fun was finding things, the other half (maybe more) was announcing it through the walkie talkie! Bring along portable sporting equipment… soccer ball, ball and bat, football, corn hole game, ladder golf toss game. 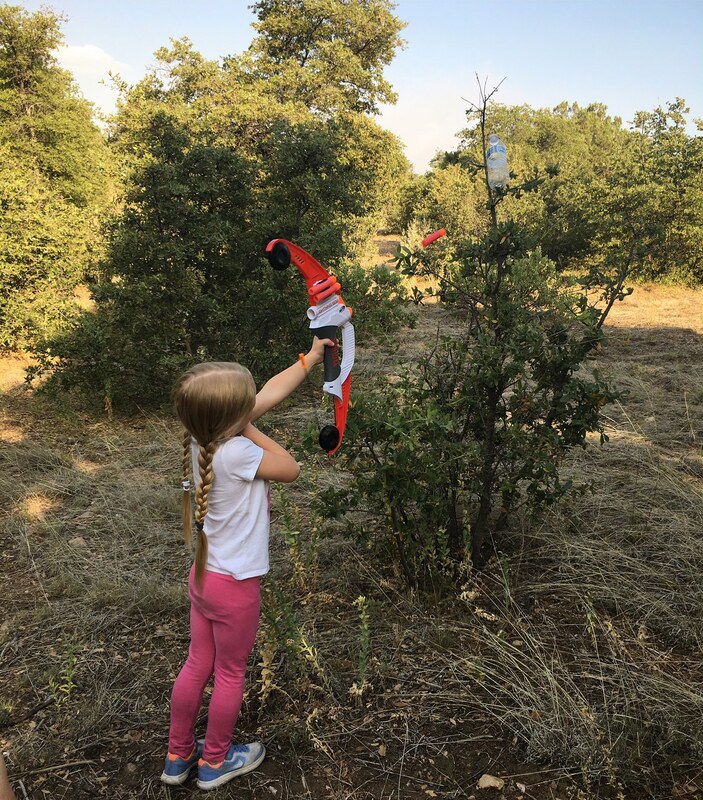 Create a nerf archery course! 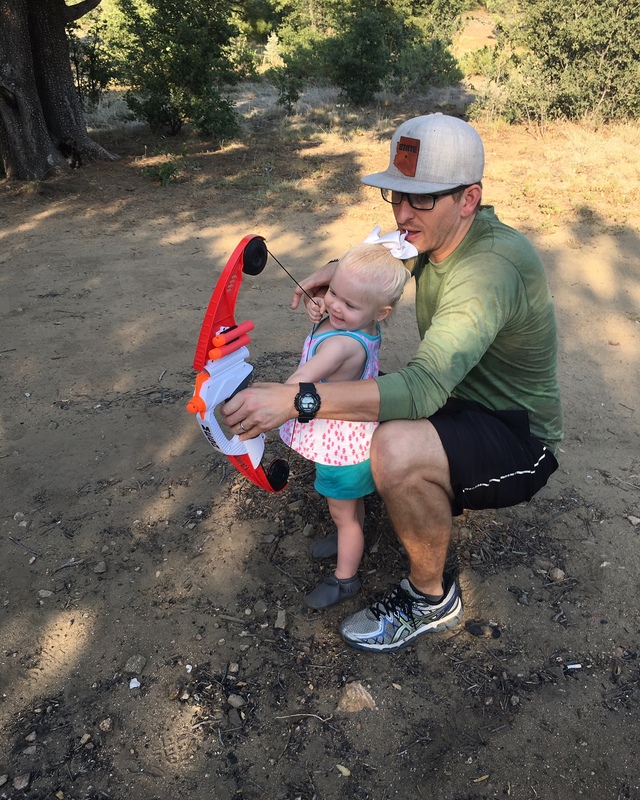 This was a hit with our girls, they are too young to shoot a real bow, so this was the perfect activity. We set up targets throughout the campsite for them to shoot at and trust me, bring a lot of extra nerf darts. 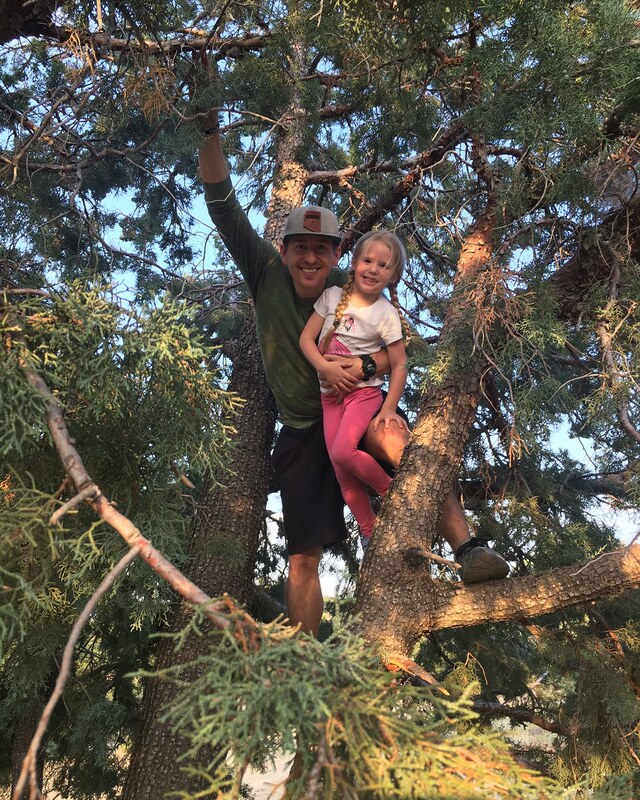 We also let them climb trees for the first time! My girls love to color so we also brought crayons and coloring books and water color paints. All make for easy clean up! You could also play card games and if you have a little one, this camping-themed toy set is perfect for your adventure! Bring music! We love country music so we had it playing all day and night to keep us in the country mood. A bluetooth wireless speaker is the way to go, and helps create a nice vibe in camp! Another great activity if you are musically talented, or even if your not, is bringing a guitar and singing around the campfire. There is nothing more kumbaya than that! 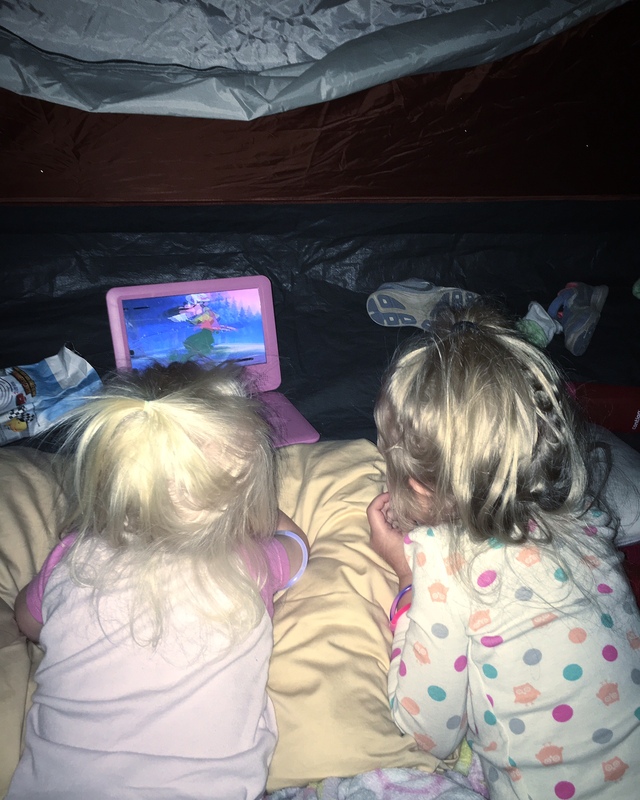 I am all about shutting down the electronics, but let’s face it, our girls are 2 and 4…. so when the sun had set, and we were all snuggled up in the tent trying to get everyone to fall asleep, I brought out the fully-charged portable DVD player, and it worked like a charm. The girls fell asleep watching a movie. Of course I picked a movie to coincide with what we were doing, camping, so we watched A Goofy Movie! It was entertaining for all. 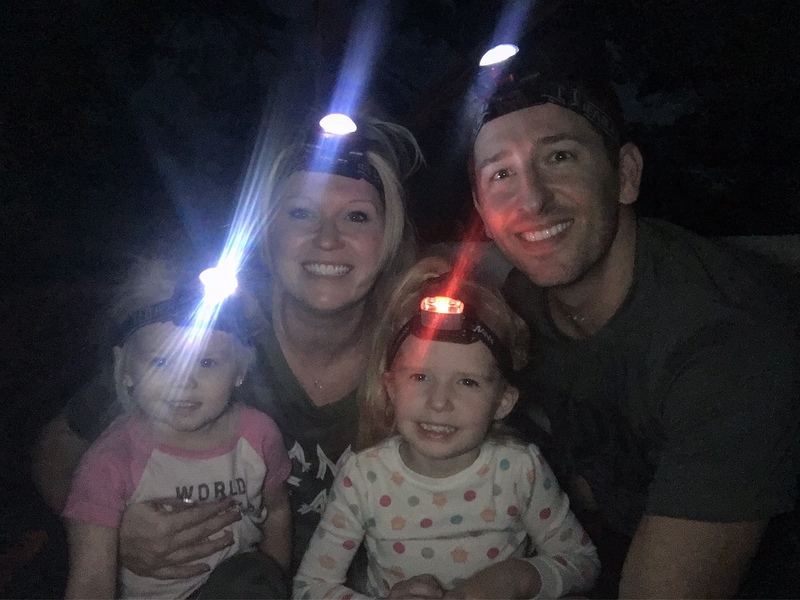 It’s the little things that make the littles happy, so bring a set of head lamps for each one to wear once it gets dark. A good ol’ fashion flash light works great too, just be sure to have one for each kid, otherwise we all know how that ends! We also added in a fun element by bringing colorful glow stick bracelets. Food! Bring more than you think you will need, especially snacks. There is something about being outside that makes them want to snack 24/7. Since we didn’t have a fire, which was less than ideal, we kept it easy with pre-made sandwiches and hot dogs with fruit and chips. I brought granola bars and trail mix to snack on throughout the time and of course fruit snacks! 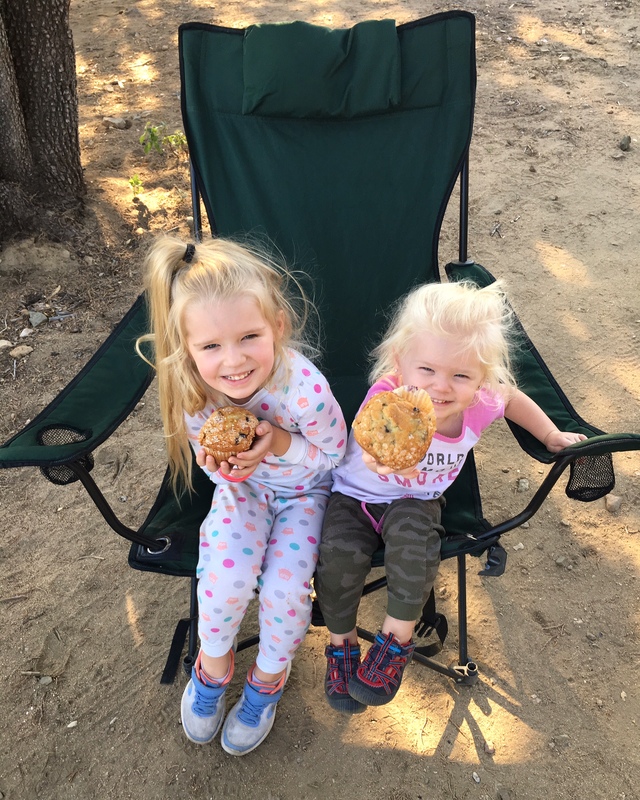 Also, make breakfast easy… a package of muffins, bagels or donuts are perfect because they don’t take up space in your cooler and the kids can grab them when they wake up! Let the kids help. 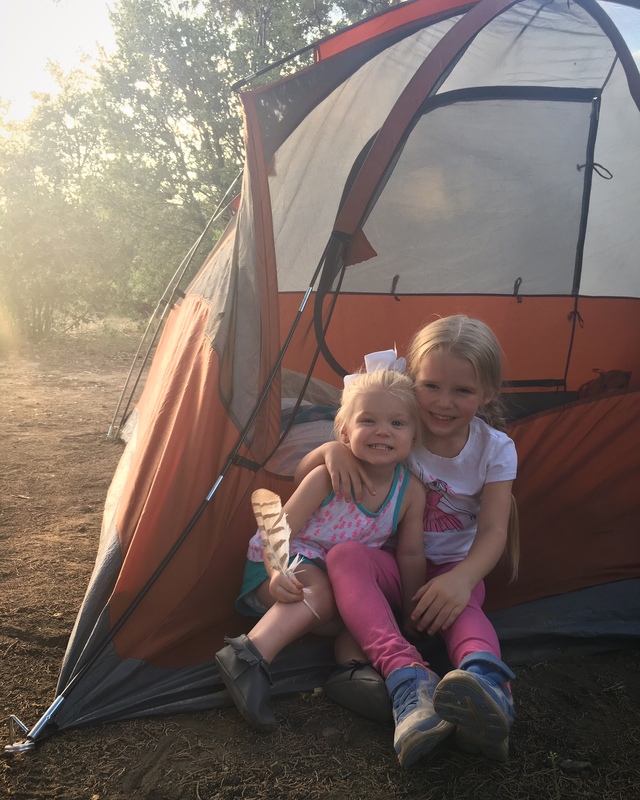 Pitching a tent is something they won’t forget, give them small tasks to allow them to feel involved, let them roll out their sleeping bag and pick their spot. 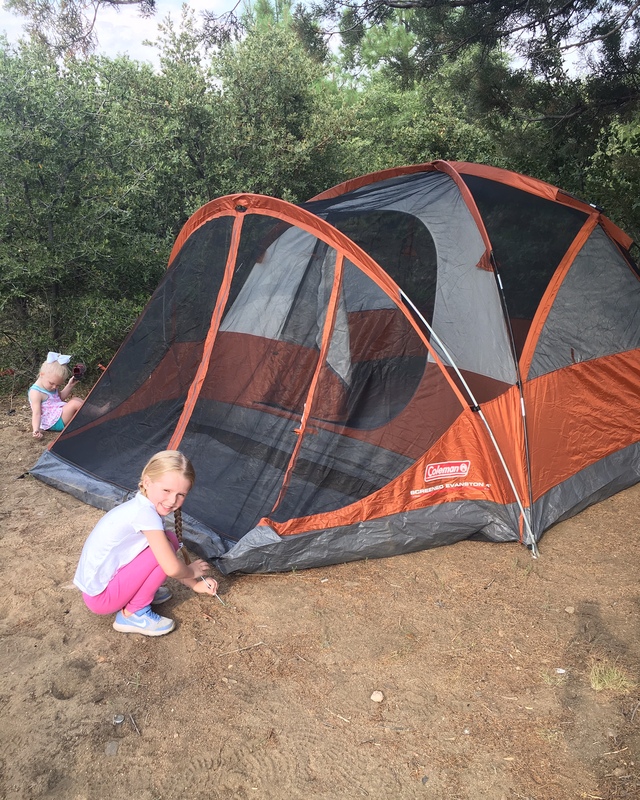 We have a 4 person Coleman tent, and it’s perfect for our family. 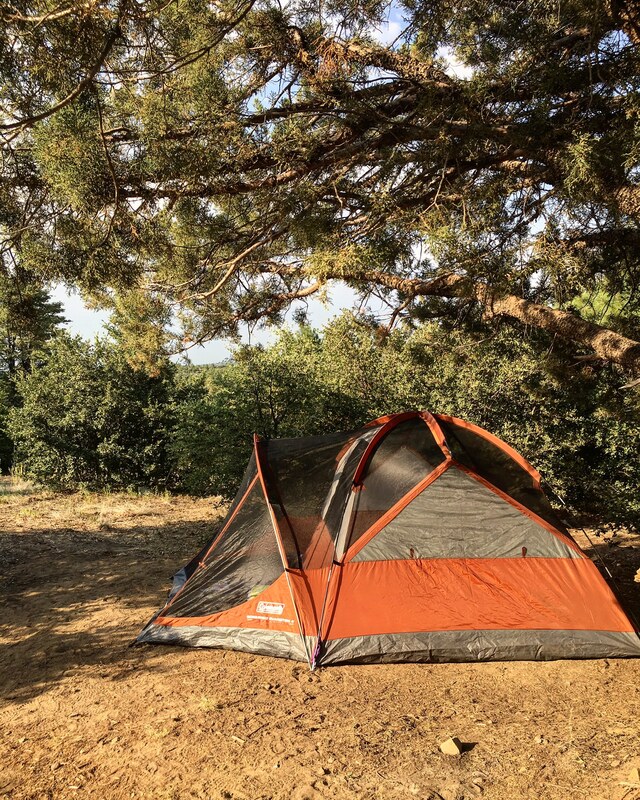 When searching for a tent for your camping trip, I recommend that you select one with a screened front porch area. This feature will give you more protected space and help keep your actual sleeping area clean and uncluttered. Trust me, this is really helpful with kids! 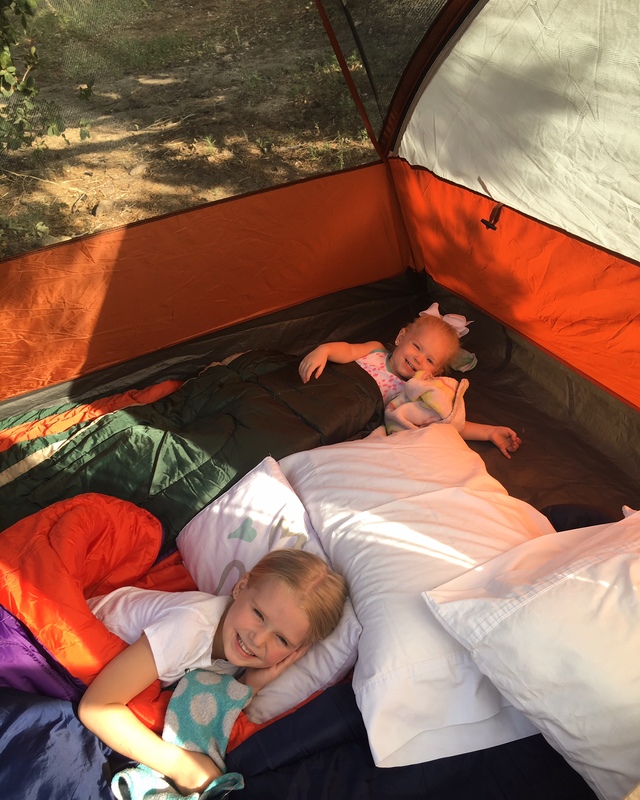 *If you are bringing a littler one who still uses a pack n’ play, just make sure to select a larger sized tent. Don’t forget… Wipes, the kiddos will touch everything! TP, enough said! Extra batteries! Bug spray, citronella candles and sunblock! Chairs, the girls loves having their own seat! Water! We kept a whole case of water in our car and always had a bottle handy. Make it comfortable, at least for the adults. If you don’t like sleeping on the hard ground, like me, bring an air mattress, pad or a cot. After one night of tossing and turning on a hard ground, you’ll never camp without them again! The kids are young and agile, they won’t know the difference… but take it from me, you most definitely will. If your kids already love comforts, check out this air mattress for kids. 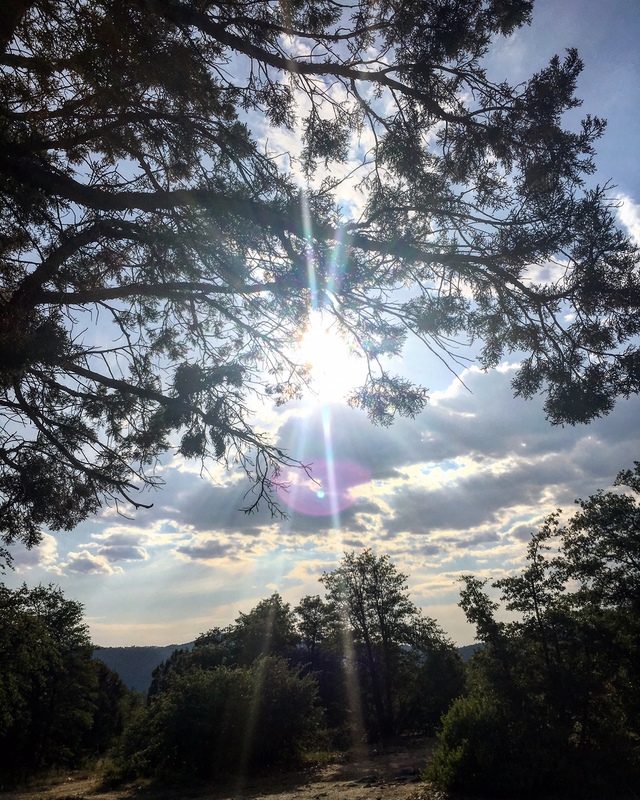 I hope these tips and tricks make your upcoming camping trip memorable… because let’s face it, we all want happy campers! LOVE this post!! I need to plan a camping trip this summer. Thank you Jenna! Hi Nadine, Thank you so much! I am glad it is helpful to you and your summer plans! Happy camping! I’m not much of a camper (at all) but you make it look like so much fun!! I never was before I met my hubby, but now I really enjoy it! This is great! 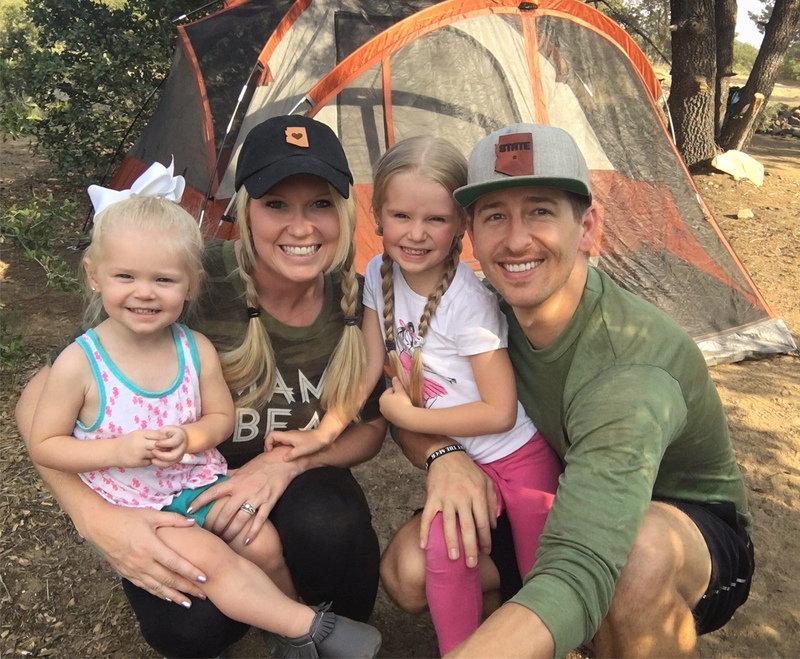 We were just planning our first Oregon camping trip with kiddos! Oh good, you will love it! Oh my word! 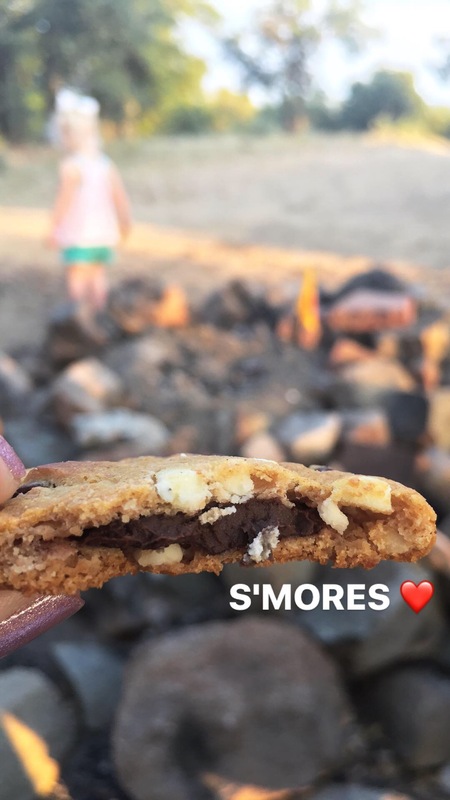 Those cookie s’mores!! You make camping look good!! Great tips! 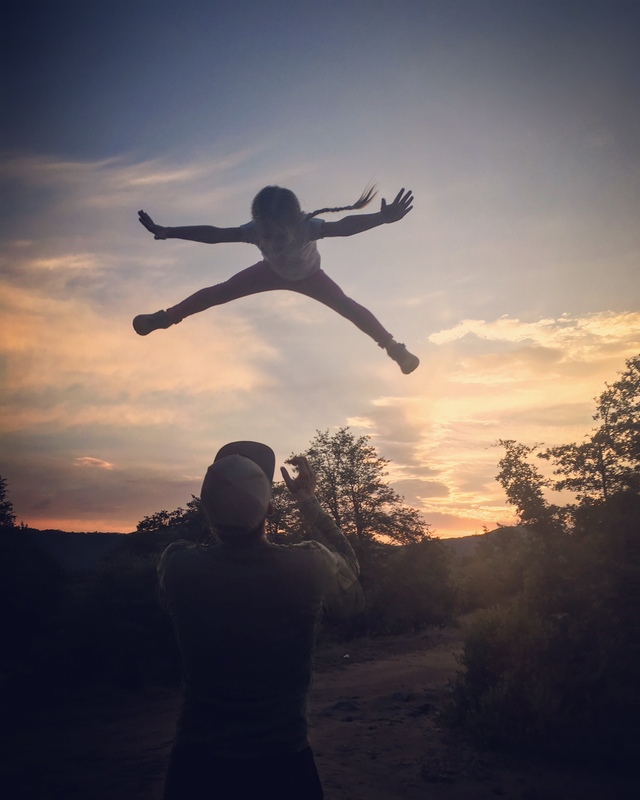 I’m always scared to take my little guy camping- but this has totally inspired me! You can do it! It is so much fun and the kids love it! Looks like you all had so much fun! 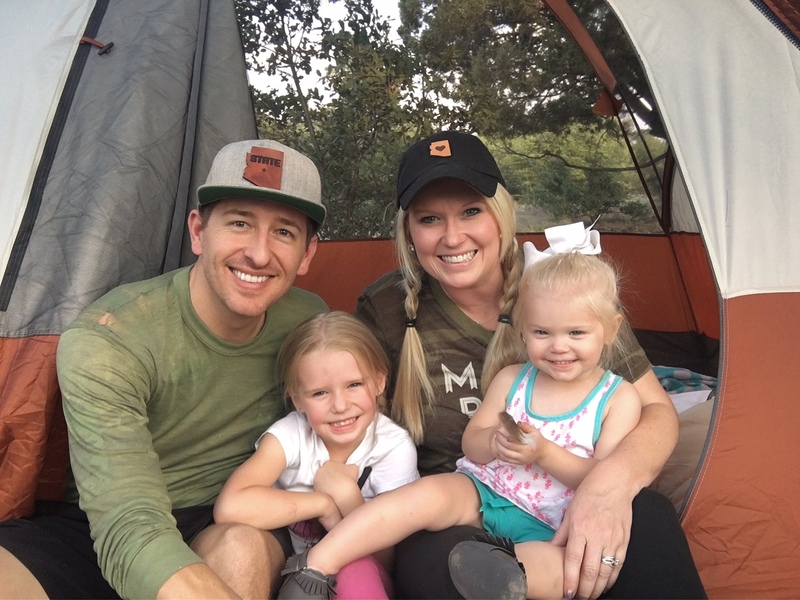 Family adventures are the best! You make it look like so much fun!! It is! Give it a try! I love these pictures from your trip, looks so fun! 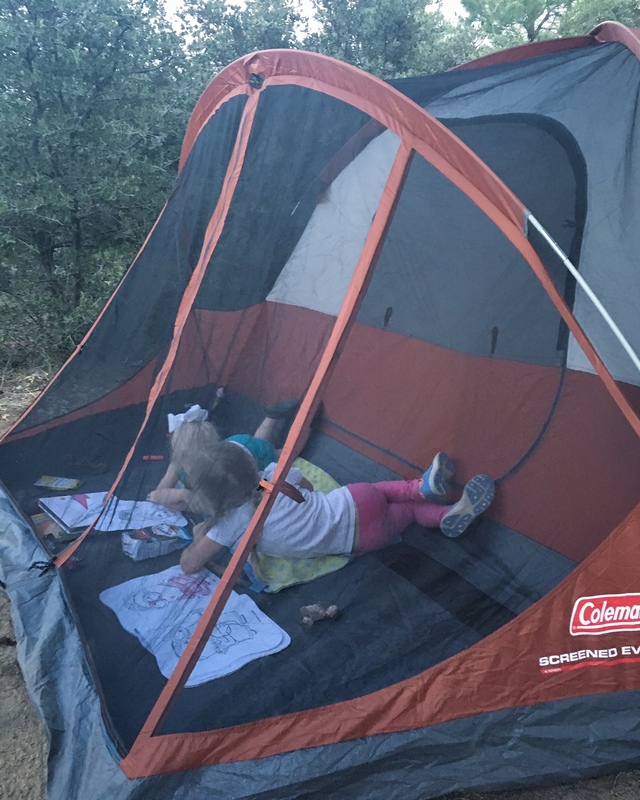 We really want to take our kids camping soon so this was really helpful! So glad you found it helpful! Yes, give it a try. It is so fun! 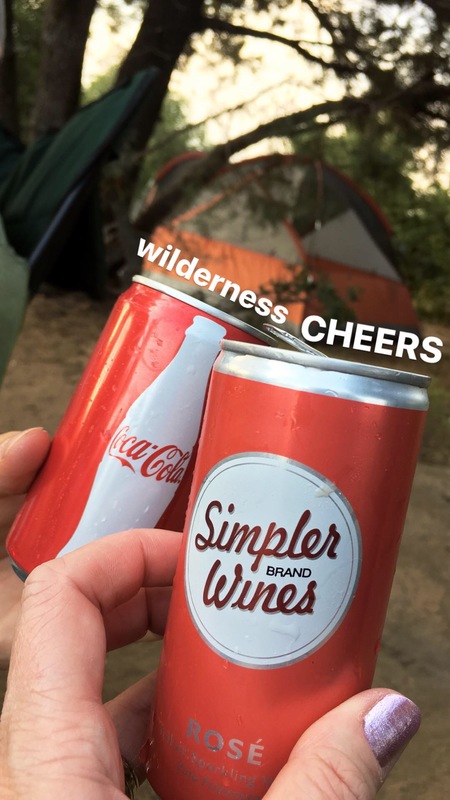 I love your outdoorsy spirit! 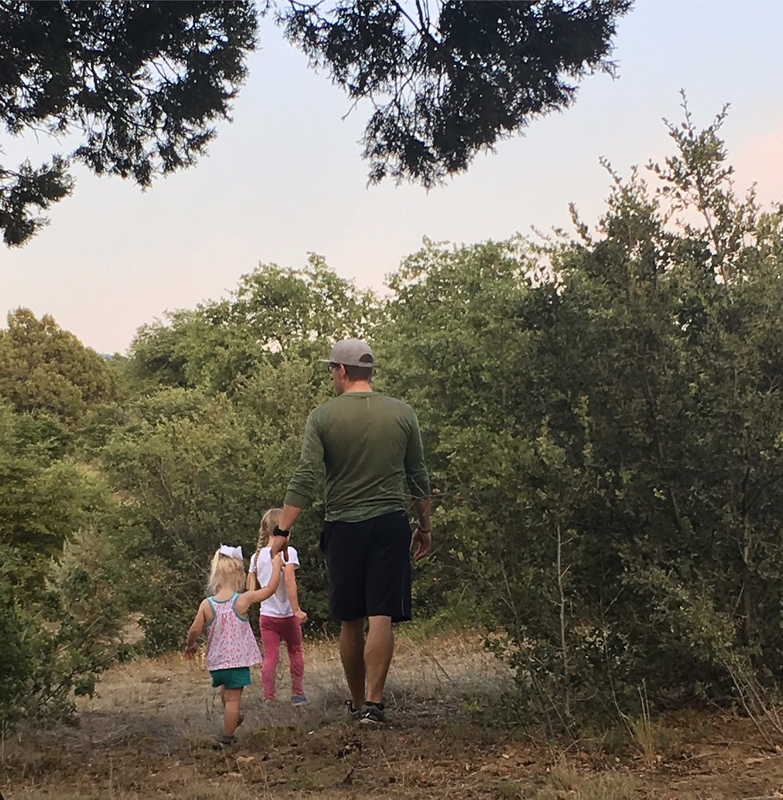 My husband literally just took our oldest camping for the first time, and I wasn’t brave enough to go with our other kids. This post made me feel better about it though, so maybe next time! I love this Jenna. This gives me hope that I might be able to execute a trip with the whole family one day! Yes, give it a try! It can be fun! 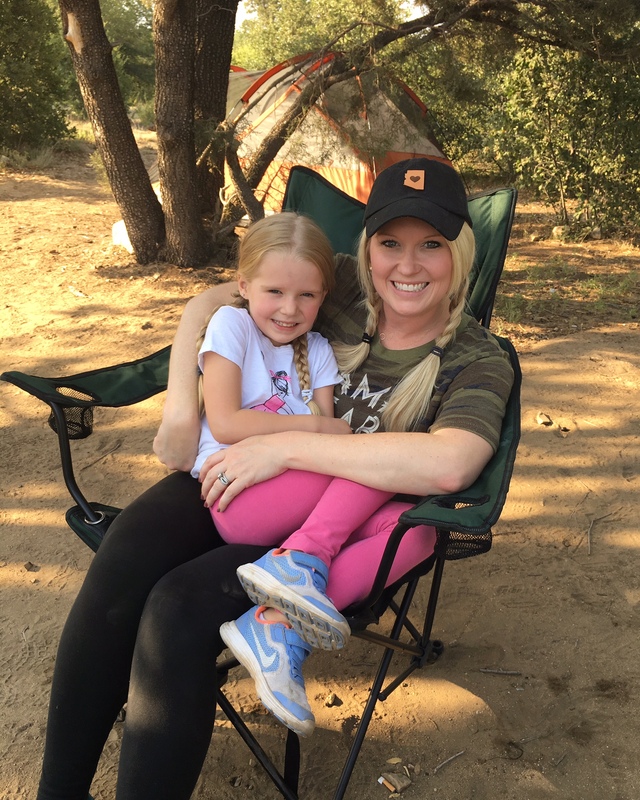 Camping is so much fun and it’s nice to have the kids there too. I think food is definitely something that you should bring a lot of! Water too! Thanks for stopping by! Glad you found it helpful! This looks like a lot of fun! 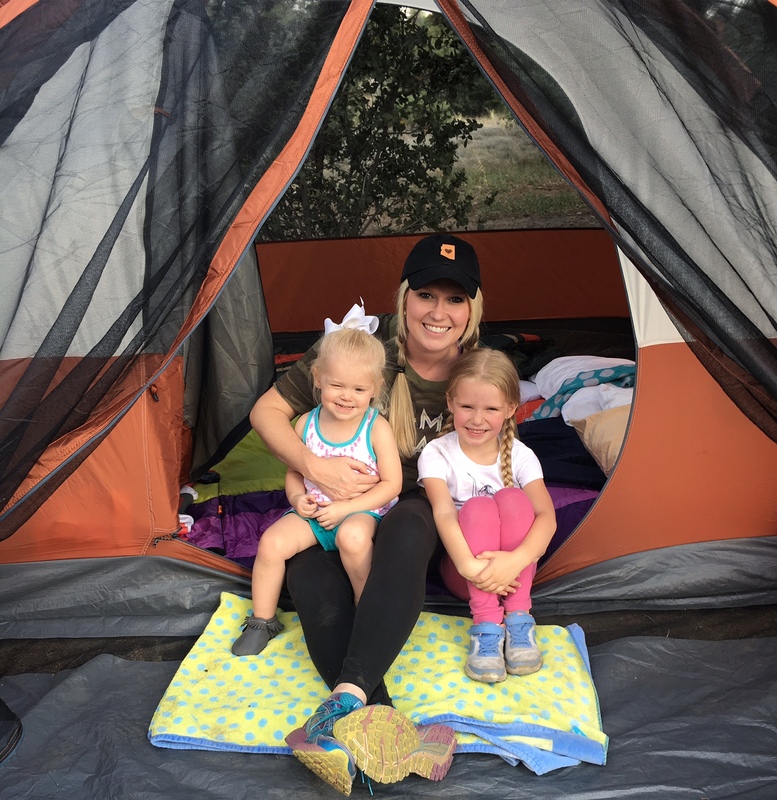 I’m not really an outdoorsy kind of girl but I bet my kids would love to go camping.